Portobello mushrooms are big, meaty and perfect for stuffing, creating a dish that is a meal unto itself. 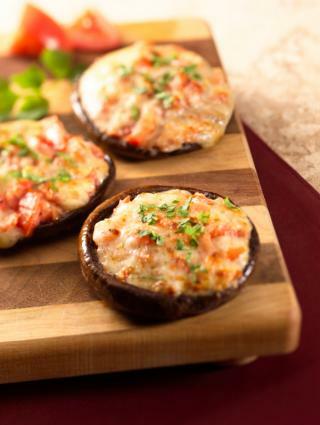 Whether you enjoy meat, vegetables or seafood, there is a stuffed Portobello mushroom recipe perfect for your tastes. Portobello mushrooms are large, cremini style gourmet mushrooms that can hold a generous amount of stuffing. They cook quickly, and when completely stuffed, they can serve as a one-dish meal. Use sweet or spicy sausage to tailor this recipe to your specific tastes. Remove the stems from each of the Portobellos, dice and set aside. Gently brush away any dirt from the mushrooms with a paper towel. Rub the front and back of each mushroom gently with 2 teaspoons of olive oil. Lightly brown the sausage in a large pan. Add in the diced onions, peppers, garlic and mushrooms stems, and cook until soft. Transfer the sausage mixture to a large bowl. Add in the spices, egg, remaining olive oil and parmesan cheese, mixing well to combine. Transfer the mixture to the tops of the mushrooms, lightly mounding them up on top. Place the mushrooms in a center rack in the oven for approximately 15 minutes. Serve warm. This meat-free recipe is still a substantial meal with the addition of cheddar cheese. Gently clean the mushrooms and remove the stems. Dice the stems and set aside. Dice the onions and peppers and combine with the stems. Heat the olive oil in a pan and sauté the vegetables under tender. Transfer the vegetables to the mushrooms and top liberally with the shredded cheese. Bake for 10 - 15 minutes or until the cheese is lightly browned. Serve immediately. This seafood-stuffed mushroom recipe adds additional texture and flavor to the mushroom caps. Gently clean the mushrooms. Remove the stems, dice them and set them aside. Combine the remaining ingredients, with the diced stems in a large bowl. Fill the cavity of each mushroom cap with the clam mixture. Bake for 15 minutes, or until mushrooms are tender. Serve immediately. Portobello mushrooms are one of the largest types of edible mushrooms, which can present some cooking challenges if you're not used to working with them. Follow these tips to ensure your stuffed Portobello mushrooms come out right every time. Gently rock and twist the stem out of each cap. Do not pull straight out as this will break the stem. Do not use water to clean the mushrooms; mushrooms soak up water easily, which will make your recipes soggy. Before stuffing, wrap a dry paper towerl over your finger, and clean under the rim of the cap to find any hidden dirt. Don't overfill. Portobello mushrooms shrink slightly and flatten out once cooked. Overstuffing the caps will result in their falling apart during the cooking process. No matter what your flavor preference, Portobello mushrooms can be stuffed to accommodate it. Give one of these recipes a try for dinner tonight and introduce the Portobello mushroom to your table.